Engaging in physical activity is beneficial for senior's hearts. A study recently published in the journal Circulation found that individuals in their 60s and 70s who participate in physical activity such as walking on a regular basis have the healthiest hearts. Researchers looked at information from almost 1,000 participants from the Cardiovascular Health Study, which started in 1989 in the U.S. with participants age 65 and older who were followed for five years. The health status, medical history and cardiovascular risk factors were evaluated at the start for each individual, and they were asked about how much physical activity they usually took part in, including sports and activities such as gardening, walking and housework. Each person also had their heart rate variability tested at the start and end of the five years for the new study. Participants were split into five groups from the least to most amounts of physical activity, and investigators found that people who engaged in the most activities had the best heart rate variability results. This was especially true in people who increased how fast or far they walked throughout the five years. 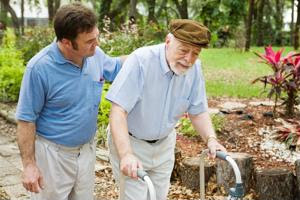 Senior care services can help patients stay physically active through physical therapy and taking them for walks.